Regular readers may recall that back in September I commenced a small binge (a binge-ette) of aspidistra buying. I have a total of eight at the moment, not all different varieties but a nice collection that makes me happy. Although they are called the 'cast iron plant' allegedly because of their robust nature and happiness to be neglected; I of the opinion that they are happy to be neglected in a very particular way and react badly to other forms of neglect. I think I have learned to water them sparingly but sufficiently and I have hopefully just resumed a careful feeding routine. All of the other aspidistras, and I do mean all, have started celebrating spring by putting up new leaves. There is something very exciting about a new leaf on an aspidistra, they are slow to grow so each new leaf is a celebration. 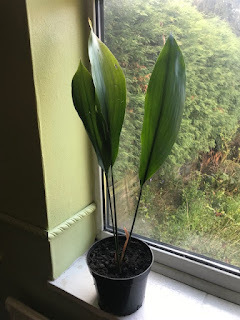 Aspidistra Asahi has not yet produced a new leaf. Every day, and I do mean every day, I check it and will it to produce that precious green spike that means a new leaf is emerging. I talk to it soothingly and encouragingly. So is it unfair that I am labelling it as irritating as it has not yet produced a new leaf? Maybe it is unfair, but here I am aspidistra-shaming it, I don't ask much of it but I would like a new leaf. Thank you. I only bought my A. elatior because apparently it is an "it" plant and I wanted to be "with it" and trendy. The plant has grown relatively fast and I really love it. Who'd a thunk?